The British Army was, in 1939, a volunteer army, that introduced limited conscription in early 1939, and full conscription shortly after the declaration of war with Germany. During the early years of the Second World War, the British Army suffered defeat in almost every theatre of war in which it was deployed. With mass conscription, the expansion of the British Army was reflected in the formation of larger armies and army groups. From 1943, the larger and better-equipped British Army never suffered a strategic defeat. 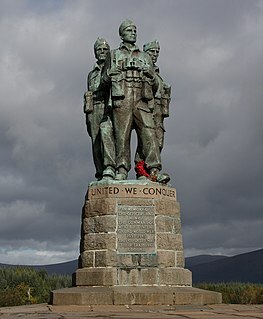 Operation Collar was the codeword for the first commando raid, conducted by the British forces, during the Second World War. The location selected for the raid was the Pas-de-Calais department on the French coast. The British Commandos had not long been formed and were not yet trained, so the operation was given to No. 11 Independent Company under the command of Major Ronnie Tod. 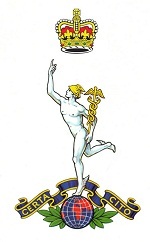 The Army Reserve is the active-duty volunteer reserve force and integrated element of the British Army. It should not be confused with the Regular Reserve whose members have formerly served full-time. 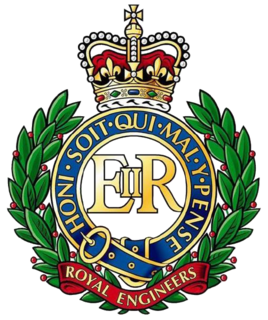 The Army Reserve was previously known as the Territorial Force from 1908 to 1921, the Territorial Army (TA) from 1921 to 1967, the Territorial and Army Volunteer Reserve (TAVR) from 1967 to 1979, and again the Territorial Army (TA) from 1979 to 2014. The 53rd (Welsh) Infantry Division was an infantry division of the British Army that fought in both World War I and World War II. Originally raised in 1908 as the Welsh Division, part of the Territorial Force (TF), the division saw service in World War I, being designated 53rd (Welsh) Division in mid-1915, and fought in the Gallipoli Campaign and in the Middle East. Remaining active in the Territorial Army (TA) during the interwar period as a peacetime formation, the division again saw action in World War II, fighting in North-western Europe from June 1944 until May 1945. The 54th Infantry Division was an infantry division of the British Army. During the First World War the division fought at Gallipoli and in the Middle East. The division was disbanded after the war but reformed in the Territorial Army in 1920. During the Second World War it was a home service division and did not see any combat service abroad and was disbanded in late 1943 but many of its component units went to see service in the Normandy Campaign and North-western Europe from June 1944 to May 1945. The Bren gun, usually called simply the Bren, are a series of light machine guns (LMG) made by Britain in the 1930s and used in various roles until 1992. While best known for its role as the British and Commonwealth forces' primary infantry LMG in World War II, it was also used in the Korean War and saw service throughout the latter half of the 20th century, including the 1982 Falklands War. Although fitted with a bipod, it could also be mounted on a tripod or vehicle-mounted. Gubbins returned to MI(R) and eventually became the director of the Special Operations Executive. Lieutenant Colonel Hugh Stockwell, who had commanded No. 2 Independent Company in Norway, set up the Commando training centre at Lochailort, before enjoying a distinguished record as a brigade and division commander. Major-General Sir Colin McVean Gubbins was the prime mover of the Special Operations Executive (SOE) in the Second World War. The Liverpool Scottish, known diminutively as "the Scottish", is a unit of the British Army, part of the Army Reserve, raised in 1900 as an infantry battalion of the King's. The Liverpool Scottish became affiliated to the Queen's Own Cameron Highlanders in the 1920s and formally transferred to the regiment in 1937 with its identity preserved. Reflecting the Territorial Army's decline in size since the late 1940s, the battalion was reduced to a company in 1967, then to a platoon of "A" (King's) Company, King's and Cheshire Regiment in 1999. In 2006, the company was incorporated into the 4th Battalion, Duke of Lancaster's Regiment. The Actions in Nordland were part of the Norwegian Campaign of World War II. 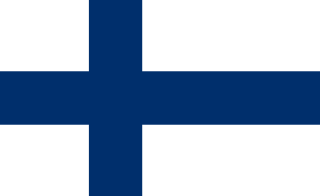 They were a subsidiary part of the Allied attempt to recapture Narvik. ↑ A Brief History of the Independent Companies of South Carolina: Based on The American Independent Companies of the British Army 1664-1764. ↑ The British Military Presence in America, 1660-1720. History Reconsiderered, LLC. 2010. ↑ Lt. John Foote of Burmuda, Of the Independant Company of Foote, And His Decendants ( Lt. John Foote was an officer of the Independent Company of Foot of Bermuda ). Foote Family Association of America. ↑ Milton, Giles (2016). The Ministry of Ungentlemanly Warfare. London: John Murray. p. 53. ISBN 978-1-444-79895-1. Adams, Jack (1989). The Doomed Expedition: The Campaign in Norway, 1940. Pen & Sword Military. ISBN 9780850520361. Moreman, Timothy Robert (2006). British Commandos 1940-46. Osprey Publishing. ISBN 1-84176-986-X.